Sierra Nevada Corporation is developing its Dream Chaser spaceplane to ferry astronauts to Earth orbit and to the International Space Station. Sierra Nevada Corp.'s Dream Chaser space plane is a planned reusable winged spaceship designed to launch atop an Atlas 5 rocket to carry astronauts into low-Earth orbit. The spacecraft is expected to carry crews of six or seven people and is based on the HL-20 lifting body design developed by NASA after seeing images of Russia's BOR-2 craft during the Cold War. 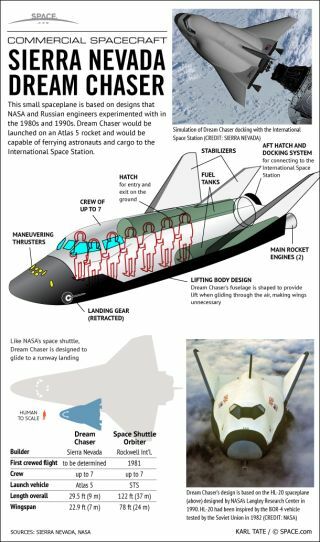 Learn more about the Dream Chaser space plane in this SPACE.com infographic.